The head region of a yellow (upper) and a silver eel (lower). Yellow eels have a yellowish color, while silver eels are characterized by a grey back and white belly. Notice the enlarged eyes and pectoral fins of the silver eel. Figure courtesy Pieterjan Verhelst. Rivers: they are considered the veins of the Earth, providing numerous goods and services such as nutrient fluxes, habitat connectivity, food, and drinking water sources. Apart from holding an immense underwater ecosystem, rivers act as important highways for diadromous fish species. This group of fish needs to migrate between freshwater and the sea to fulfill their lifecycle, and they can be divided into anadromous and catadromous species. Anadromous fish grow in marine environments and spawn in freshwater (e.g. salmonids), while catadromous fish do the opposite (e.g. Anguillid eels). Yet, many rivers are nowadays obstructed by so-called migration barriers, such as hydropower and pumping stations or dams and sluices, impeding fish migration. A much less understood effect related to fish migration is the impact of navigable canals and their shipping locks. Many navigable canals were built during the Anthropocene to facilitate shipping between economic hotspots (e.g. major cities). To overcome the elevation difference (i.e. the head-drop) between the two connecting points, shipping locks were built, which allow ships to ascend or descend through the canal. A fish species of particular interest is the European eel (Anguilla anguilla L.). Reports on the European eel decline date back to the early 1800s. It was not, however, until the 1970s that a substantial decline in the recruitment was apparent, indicating a decline between 90% and 99%. This led to the species being listed as critically endangered in 2008 under the IUCN Red List. Various causes likely contributed to this decline, among the most referred to in literature being migration barriers, habitat loss and deterioration, pollution, overexploitation, human-introduced parasites and changes in ocean climate. To aid conservation and recovery of the European eel population, the European Union adopted a Council Regulation (European Eel Regulation; EC no. 1100/2007) in 2007 which imposes a management system that ensures 40% escapement of the spawning stock biomass, defined as the best estimate of the theoretical escapement rate if the stock was completely free of anthropogenic influences. The distribution of the European eel population ranges from Northern Europe in Iceland and Norway over the Mediterranean to Northern Africa. It has a remarkable life cycle characterized by intensive migrations. Although neither spawning eels nor eggs have been observed in the wild, it is assumed that the European eel spawns in the Sargasso Sea. The Sargasso Sea is located in the Atlantic Ocean covering a relatively large area over one million square miles (ca 20–30°N, 48–79°W). This assumption was first made in the early 1900s when a Danish scientist called Johannes Schmidt fished against the incoming waves of willow-shaped eel larvae, i.e. leptocephalus larvae. It was in the Sargasso Sea that the smallest stadium (7 mm) of these larvae was found. The larvae drift with the eastward flow of the Gulf Stream, then follow the North Atlantic Drift towards the European continent and North Africa. It is near the continental slope that the leptocephalus larvae transform into glass eels, small eels lacking pigmentation. Some glass eels will stay in coastal areas and estuaries, while others will migrate upstream in rivers. During the following stage, the glass eels start to pigment and develop into yellow eels. During this demersal growing stage, which can take over a decade, eels accumulate fat and prepare themselves to migrate back to the spawning location as silvers eels. This stage is characterized by a dark dorsal side and silver-white belly accompanied by enlarged pectoral fins and eyes; adaptations to prepare themselves for pelagic swimming in the Atlantic Ocean. However, as silver eels migrate back to the sea they encounter the numerous above-mentioned migration barriers. 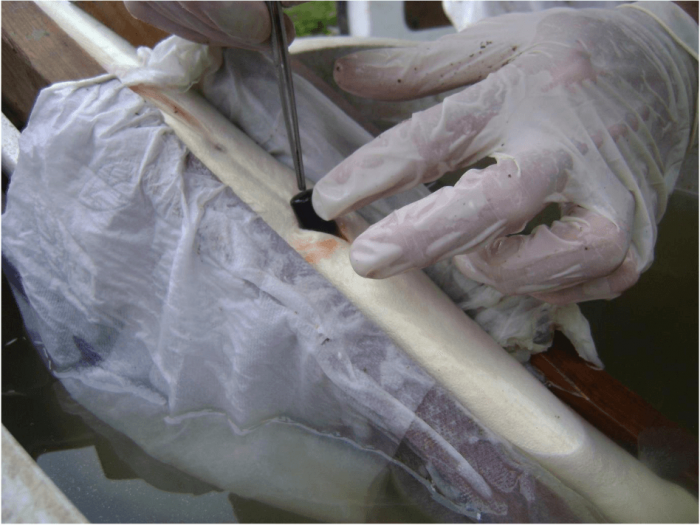 Since many knowledge gaps exist related to eel migration in shipping canals, 70 silver eels were tagged and tracked in a 130-km long Belgian shipping canal (the Albert Canal) from September 2014 till December 2016. Field experiments were conducted by the Research Institute for Nature and Forest in collaboration with Ghent University and the Flanders Marine Institute, supported by the Belgian Lifewatch Observatory (http://www.lifewatch.be/en/fish-acoustic-receiver-network). The Albert Canal connects the harbor of Antwerp at the Schelde Estuary with Liège at the Meuse River and has 6 shipping locks to overcome the 56-m head-drop, dividing the canal into seven sections. Due to the filling and emptying of the shipping locks, a lot of backwash is apparent, alternated by standing water. Yet, the net water flow is downstream toward the Schelde Estuary. The acoustic transmitter is placed in the abdominal cavity through a small surgery. Figure courtesy Pieterjan Verhelst. The silver eels were tagged with acoustic transmitters; a transmitter was surgically implanted in the abdominal cavity and the opening is carefully stitched. Each transmitter emits a sound with a unique ID code which can be detected by a network of receivers, deployed in the canal. The receivers are visited twice a year to download the data with a laptop. As the canal connects the Schelde Estuary with the Meuse River, eels can leave the canal in both directions, which was apparent during the tracking study. 12 eels left the canal via the Schelde Estuary and another 12 via the Meuse River. Another 15 migrated toward the Schelde Estuary, but were unable to leave the system during the study period. However, the majority of the eels (n = 31) did not show a sign of directional migration. Although 24 eels were able to exit the Albert Canal, their migration speed was substantially lower (0.01 m/s for eels migrating into the Schelde Estuary and 0.05 m/s for eels into the Meuse River) compared to the silver eel migration speeds reported in other studies in rivers (ca. 0.50 – 1.00 m/s). These findings indicate that silver eels are heavily delayed during their migration in the shipping canal. As a consequence, we looked deeper into the characteristics of the canal to find out where and why they were obstructed. The Albert Canal (AC) connects the Schelde Estuary (SE) in Antwerp (tidal sluices indicated by grey bars) with the Meuse River (M) in Liège. The Albert Canal is divided into seven canal sections (A–G) by six shipping lock complexes (indicated by black bars). Positions of the receivers are indicated as blue triangles and catch-release locations (C&R) as grey asterisks. Image courtesy Pieterjan Verhelst. The migration speed of the 39 migrating silver eels was similarly low for each canal section, except for the most downstream section located at the docks of Antwerp. This can likely be explained by the fact that the weak water current, which eels use as a guiding cue to migrate to the sea, drops to a standstill when the water is distributed over the docks. Consequently, the eels lose the guiding cue and probably get disoriented, leading to searching behavior and delays to exit the Albert Canal. 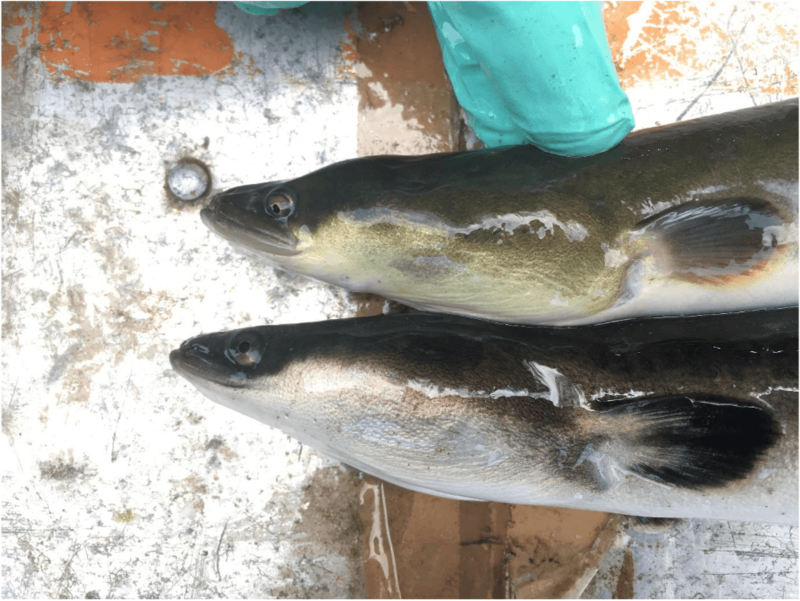 Next, we analyzed whether the shipping locks acted as migration barriers, and indeed, the residence time of the migrating silver eels upstream of a shipping lock was double as high compared to downstream the shipping lock. Notably, successful passage of the shipping locks mainly occurred at night, which is in line with the eel’s nocturnal nature. Furthermore, the consensus is that European eels migrate back to the sea around autumn, but in the Albert Canal, the eels migrated substantial distances during spring as well. This is likely a response to their ineffectiveness in autumn. To our knowledge, this study is the first to describe silver eel migration behavior in a shipping canal with shipping locks. The findings of this study indicate that European silver eels find difficulties in leaving the Albert Canal. Not only directly due to the physical obstruction by shipping locks but probably also due to the highly-regulated water flow. That is, eels use increases in discharge as a guiding cue to migrate to the sea. Interference with this cue likely causes disorientation, leading to delays, observed in this study as a very low migration speed. Therefore, heavily-regulated shipping canals can be unsuited for silver eel migration. However, sometimes it is the only possible route for eels to reach the sea or the alternative is even worse. For instance, studies have shown that the hydropower stations located in the Meuse River (the alternative route for the eels in this study to reach the sea) cause substantial mortality among migrating silver eels. Hence, efficient silver eel migration in shipping canals may be stimulated by maintaining a sufficient unidirectional flow. Although practicalities will depend on each specific canal, management could strive to increase discharge over weirs or set shipping locks ajar. Obviously, such actions can be in conflict with shipping, but since silver eels are mainly active at night during autumn at moments with increases in precipitation, management could strive to implement specific actions during those “migration windows.” For instance, in some canals, there is no shipping at night, which may open opportunities for eel management. Further, there is an urgent need for improved knowledge on efficient downstream fish passes to circumvent migration barriers, as success stories are scarce. The results of this study also put the implementation of glass eel stocking, as part of the eel management plan imposed by the European Eel Regulation in 2007, into perspective. Since a large part of the eels are not able to migrate successfully within a foreseeable time in the canal, we suggest reducing or even stopping glass eel stocking in large shipping canals. But obviously, this requires further insight in diadromous fish migration behavior in heavily-regulated canals to aid cost-efficient management and population restoration. These findings are described in the article entitled European silver eel (Anguilla anguilla L.) migration behaviour in a highly regulated shipping canal, recently published in the journal Fisheries Research (Fisheries Research 206 (2018) 176-184). This work was conducted by Pieterjan Verhelst from Ghent University, Research Institute for Nature and Forest (INBO), and Flanders Marine Institute, Raf Baeyens, Johan Coeck, and Ans Mouton from Research Institute for Nature and Forest (INBO), Jan Reubens from Flanders Marine Institute, Jean-Phillippe Benitez and Michaël Ovidio from the University of Liège, and Peter Goethals, Jenna Vergeynst, and Tom Moens from Ghent University. Pieterjan Verhelst currently works at the Department of Biology, Ghent University. Pieterjan does research in Ecology, Marine Biology and Limnology. Their current project is 'The importance of estuarine and coastal areas for the migration of fish and recovery of populations'.